e-Sword® — the world's most popular PC Bible study software is now available on the world's most advanced mobile operating system! e-Sword LT is the little brother of e-Sword HD for the iPad, but has many of the same powerful features in a slimmer design for the iPhone. e-Sword LT is feature rich and user friendly. As your Biblical library grows you will appreciate the intuitive layout and synchronization of resources. e-Sword LT is so easy to use you may never need to read the Tutorial! EVERYTHING NEEDED to study the Bible in an enjoyable and enriching manner. All Bibles, commentaries, dictionaries, … everything is just a tap away! POWERFUL SEARCHES that are simple to use. Enter as many words you want to search for and select the settings. You can even search on Strong numbers! STRONG'S DEFINITIONS are just a tap away and presented in a popover. SCRIPTURE REFERENCES too are just a tap away and presented in a popover. 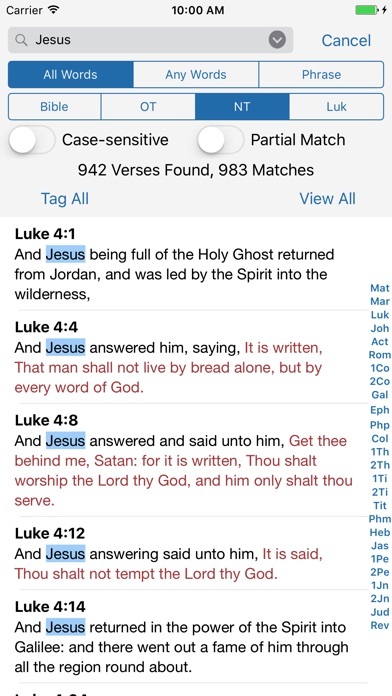 COMPARE BIBLES quickly to see how the different versions translate a verse. 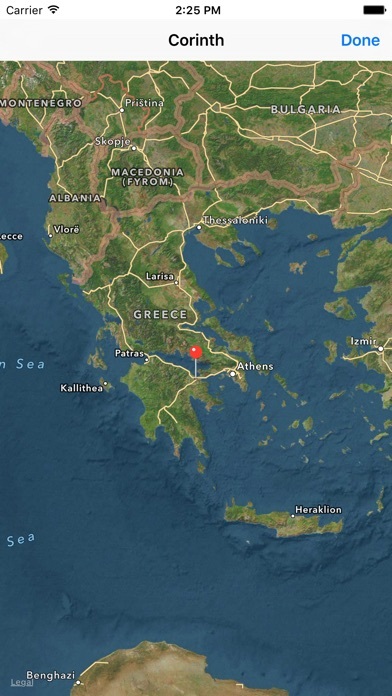 LOCATION MAPS pin-point Biblical places on live modern maps to help bring the narrative to life! READING PLANS designed to help you grow in your knowledge of the Bible. FORMATTED EMAILS of any selection of any text. Perfect for sharing with others. No Internet connection is required to use e-Sword LT. e-Sword LT initially installs with the King James Bible and the King James with Strong's numbers study Bible, the Strong's Lexicon, Smith's Bible dictionary, Meyer's devotional commentary, and the Treasury of Scripture Knowledge cross references. There are over one hundred additional Bibles, commentaries, dictionaries, reference books and devotionals that you can download and add to your library absolutely free! Also available are some "locked" resources which must be purchased from their publisher. These are copyright and licensing requirements which are unavoidable. Please note that e-Sword LT is an *ENGLISH* release (but does include Spanish and Portuguese UI localization.) 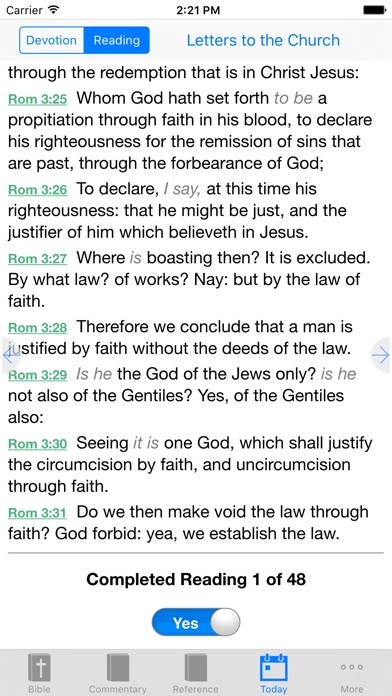 There are dozens of non-English Bibles available, but all other content is in English. The perfect app on the perfect device. What are you waiting for? Download e-Sword LT today and get to studying the Bible! App freezes. Audio will not change from one chapter to another without exiting & reentering,2-3 times,this is really frustrating. I have tried most of the available Bible apps and this one, for me, is the best. Intuitive and efficient navigation along with access to the most diverse selection of commentaries, reading plans and other references. This is a great and necessary resource. Keep up the good work! This breaks down everything to your understanding. Everything is revealed. This is the greatest most comprehensive and can be downloaded easily. So many features, I especially like the define option. Very well thought out format. This app really needs a facelift and updated functions. I miss Mysword app on Android so much when I use this app..
My goto app for study on my iPhone and Mac. The free selections are many and there is the option to purchase others. The layout is nice and the functions keep getting better with updates. I like the ability to copy formatted verses in my work. Perhaps my favorite aspect is the easy flow of functions from history to use of commentaries and dictionaries. I’m grateful to the developer for offering those of us a limited income a richly-featured Bible app. Excellent. I do not know what else I would add. It takes some time to learn because there are so many capabilities provided. I sincerely hope the authors keep up with the changes Apple imposes on them. I use it a lot, and appreciate the many languages provided. I’ve been studying the Word since I was young so I’ve come across many Bible tools, and I can confidently say this is my FAVORITE Bible app, hands down! I LOVE that the Greek/Hebrew references are clickable—right there next to each word, which makes it very easy to quickly look up an original meaning and then return to my reading. I do think navigating the other features takes a little getting used to, but once I figured it out, I was hooked. I love the Bible dictionary feature and downloaded one that works for me. I was even able to download my favorite commentary (David Guzik) which I was THRILLED about, so now I don’t have to leave the app to look that up. The compare feature (to compare translations) is cool. One thing that some may find as a downside is that you may have to pay for a translation that you like. (You basically are buying the e-Sword compatible version of that bible, then downloading it.) But I didn’t mind spending money on a Bible—I got NKJV and NLT and I feel it was well worth it which made my studying easier, so I can read them within e-Sword. But if you don’t want to spend money, there are a lot of free translations you can choose from. A great app!